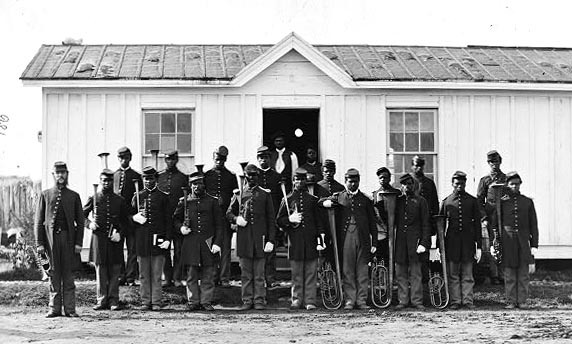 Band of the 107th United States Colored Infantry at Fort Corcoran, Alexandria (Arlington) County, 1865. 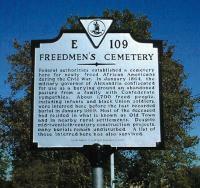 The following information is drawn from the special 1890 federal census of Civil War veterans and widows. In addition to Alexandrians, African-American veterans from Alexandria (now Arlington) County have been included, as have former soldiers living in or near parts of Fairfax County that have since been annexed by the City of Alexandria. The census does not distinguish individuals by race; identification has been made either on the basis of their regiment or from entries in the Alexandria city directories of 1888-89 and 1895. Because many of the veterans were not identified by unit, we cannot be certain that all of the African American veterans have been included here or all white veterans excluded (and one black veteran was dropped from the list because he did not serve in the Civil War but was a Buffalo Soldier). Those names below that are marked with an asterisk may not be African Americans. The addresses in brackets have been drawn from the city directories. Co. B, 8 PA Col. Inf. "Mustered out in Texas and paid off in Phila. Pa."
Washington District, (Falls Church P.O. ), Fairfax Co.
Government reservation, Arlington P.O., Arlington Co.
"Paralysis f[rom exposure], old and feeble minded"
"Both feet amputated, frost bitten"
Vienna, Providence District, Fairfax Co.
29 CT Col. Inf. ? Co. H, 5 MA Col. Cav. Annandale, Falls Church District, Fairfax Co.